Learn quantitative trading analysis from basic to expert level through a practical course with R statistical software. Disclaimer: If you sign up for a (paid) course using this link, R-exercises earns a commission. It does not impact what you pay for a course, and helps us to keep R-exercises free. Learn quantitative trading analysis through a practical course with R statistical software using index replicating fund historical data for back-testing. It explores main concepts from basic to expert level which can help you achieve better grades, develop your academic career, apply your knowledge at work or take decisions as DIY investor. All of this while exploring the wisdom of Nobel Prize winners and best practitioners in the field. Download index replicating fund data to perform quantitative trading analysis operations by installing related packages and running script on RStudio IDE. Implement trading strategies by defining indicators, identifying signals they generate and outlining rules that accompany them. Explore strategies based on simple moving averages SMA, moving averages convergence-divergence MACD, Bollinger Bands®, relative strength index RSI and statistical arbitrage through z-score. Calculate main trading statistics such as net profit and loss to maximum drawdown ratio and equity curve. Measure principal performance metrics such as annualized returns, standard deviation and Sharpe ratio. Estimate key risk management metrics such as maximum adverse excursion MAE, maximum favorable excursion MFE and Kelly ratio. Maximize historical risk adjusted performance by optimizing strategy parameters. Minimize historically optimized strategy over-fitting through walk forward analysis. Learning quantitative trading analysis is indispensable for finance careers in areas such as quantitative research, quantitative development, and quantitative trading mainly within investment banks and hedge funds. It is also essential for academic careers in quantitative finance. And it is necessary for DIY investors’ quantitative trading research and development. But as learning curve can become steep as complexity grows, this course helps by leading you step by step using index replicating fund historical data for back-testing to achieve greater effectiveness. This practical course contains 53 lectures and 7 hours of content. It’s designed for all quantitative trading analysis knowledge levels and a basic understanding of R statistical software is useful but not required. 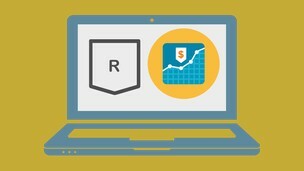 At first, you’ll learn how to download index replicating fund data to perform quantitative trading analysis operations by installing related packages and running script on RStudio IDE. Then, you’ll implement trading strategy by defining indicators based on its category and frequency, identifying trading signals these generate, outlining trading rules that accompany them and applying all of the above. You’ll do this while exploring main strategy categories of trend-following and mean-reversion with indicators such as simple moving averages SMA, moving averages convergence-divergence MACD, Bollinger Bands®, relative strength index RSI and statistical arbitrage through z-score. After that, you’ll do strategy reporting by evaluating simulated strategy risk adjusted performance with historical data while exploring main areas of trading statistics, performance and risk management metrics. For this, you’ll calculate main trading statistics such as net profit and loss, maximum drawdown, profit to maximum drawdown ratio and equity curve. You’ll also measure principal performance metrics such as annualized returns standard deviation and Sharpe ratio. And you’ll estimate key risk management metrics such as maximum adverse excursion MAE, maximum favorable excursion MFE and Kelly ratio. Later, you’ll optimize strategy parameters by maximizing historical risk adjusted performance measured by net trading profit and loss, maximum drawdown and profit to maximum drawdown metrics. You’ll implement this through an exhaustive grid search of parameter set combinations. Finally, you’ll do strategy walk forward analysis to avoid historical parameters optimization over-fitting or data snooping by implementing a step-forward cross-validation. You’ll apply this through a rolling walk forward analysis which divides data into a training sample for parameters set optimization that is then validated on a test sample. Next, you’ll repeat this process one step-forward at a time until the end of time series. R statistical software is required. Downloading instructions included. R script files provided by instructor. Explore main trading categories through indicators such as simple moving averages SMA, moving averages convergence-divergence MACD, Bollinger Bands®, relative strength index RSI and statistical arbitrage through z-score. Calculate main trading statistics such as net trading profit and loss, maximum drawdown, profit to maximum drawdown and equity curve. Minimize optimization over-fitting through walk forward analysis implemented as step-forward cross-validation by dividing data into rolling training and testing samples. Implement trading strategies based on their category and frequency by defining indicators, identifying signals they generate and outlining rules that accompany them. Evaluate simulated strategy historical risk adjusted performance through trading statistics, returns and risk management metrics. Measure principal strategy performance metrics such as annualized returns, standard deviation and Sharpe ratio. Maximize historical risk adjusted performance by optimizing strategy parameters through an exhaustive grid search of set combinations. Students at any knowledge level who want to learn about quantitative trading analysis using R statistical software.